A Yerushalayim court on Thursday imposed sentences on two accessories to the 2015 terrorist murder of Yerushalayim resident Alexander Levlovich, 64, Hy”d, of the Armon Hanatziv neighborhood. On the eve of Rosh Hashanah of that year, a group of terrorists pummeled Levlovich’s vehicle with rocks and he lost control of his vehicle. He struck a pole and sustained critical injuries, from which he later died. Three terrorists were accessories to the crime. Convicted of murder in 2017 for the crime was Abed Dawiat, whom an investigator determined threw the stone that directly caused the crash. Dawiat reached a plea deal with prosecutors, and received a sentence of 18 years in prison. On Thursday, his terror associates – Walid Fares Atrache and Muhammad Salah Abu-Kaf – received sentences of 15 and 13 years in prison respectively. The killing of Lelovich was part of a more extended terror attack. 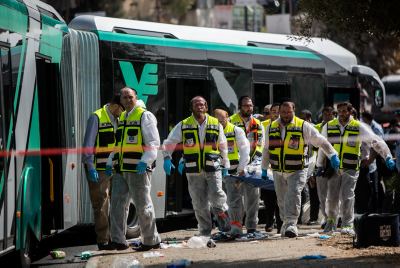 A fourth member of the terror gang – Balal Abu Ghanem – shot and killed three people, including Chaviv Chaim (78), Alon Gobeburg (51) and Richard Lakin (76), who was critically injured and later died of his wounds. All three were shot on a bus attacked by the terrorists. Along with an accomplice, Ghanem blocked the exits of the bus, ensuring that no one could get off. Sixteen people were wounded in that attack. Overnight Wednesday, security officials said they arrested 14 wanted security suspects in Yehudah and Shomron. The suspects were wanted for participating in rioting and throwing stones and firebombs that endangered Israeli civilians and IDF soldiers. Several of the suspects were also charged with belonging to Hamas. All were being questioned on their activities by security forces.